The project was designed and constructed in two phases. The scope of work for the first phase consisted of the structural design of foundations, spill containment structures, and anchorage for four cylindrical steel liquid storage tanks on a common mat foundation. 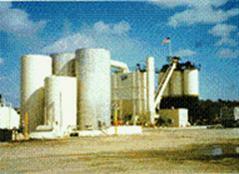 The second phase consisted of design of a pile foundation system for the batching silos and conveyor, truck scales and vehicular ramps. Synergy performed all structural design for this project. 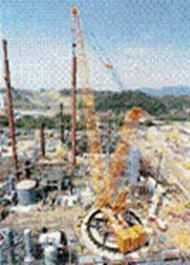 The project was a $350 million coal gasification /chemical conversion plant for Eastman Kodak. The scope of work included the design of a 5 story coal gasification plant including conveyors and silos, a steam power generation plant, over three miles of pipe racks and bridges for process piping, and a dozen subplants for producing chemical bi-products on a 55 acre site. Each subplant included design of structural foundations and supports for pumps, heat exchangers, pressure vessels, liquid storage tanks, and service platforms. Mr. Leverett was responsible for engineering design of the foundations and structures for the pipe racks, the coal conveyors, and the tanks, platforms and equipment for 3 subplants for which he performed planning and scheduling. The project involved structural analysis and design of modifications to a floating mineral sands mining - titanium ore refining barge in order to determine the feasibility of increasing its mining capacity. The barge is three stories high 120' wide and 400' long and constructed on 16 independent steel pontoons. The barge had received numerous site additions and modifications and was experiencing buoyancy problems and other signs of structural distress. Synergy performed site survey of existing conditions, performing 3D computer modeling using non-rigid supports, designing structural modifications and estimating their construction costs. Synergy designed the precast pile foundation system for the 340’ by 175’ clear span aggregate storage building and drive tower structure for the associated aggregate conveyor system for barge deliveries at US Gypsum’s gypboard manufacturing facility at Tallyrand Boulevard plant. 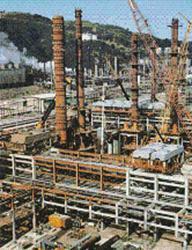 The project was a $600 million refinery expansion to triple Chevron’s national lube oil production. The project was produced in fast track design/construction delivery method. The structural scope included design of three major pipe racks and supports for process lines having a wide range of pressures and temperatures. Foundations, support structures, and service platforms were designed for process equipment, pumps, pressure vessels, electrical transformers, switchgear, and chilled water coolers. Some of the unique aspects of the structural work included dynamic analysis of foundations for reciprocating pumps and compressors, as well as blast resistant design of control rooms and laboratory buildings. Several slender structures required dynamic analysis due to their height, slenderness, and soil characteristics in at this seismic zone 4 site. The scope also involved upgrading and tieing into several adjacent plants. Mr. Leverett’s duties not only involved design of the aforementioned elements as a senior structural engineer, but included engineering supervision as lead engineer during the final year of the project which was performed on site in order to support construction operations. Other engineering duties such as planning and scheduling, material requisition, preparation of engineering cost change notices and design/construction liaison were performed. This project involved the structural design and construction of large Modularized process units used to compress tapped natural gas and inject it into the ground to maintain oil field pressures in order to pump oil. The modules which were as large as a four story building and weighting as much as 2500 tons were constructed in northern California and transported by heavy crawlers on land, and then by ocean going barges at sea during a brief period in summer when the arctic ice cap thaws along the northern Alaska coastline. The construction cost for the project was $200 million. Mr. Leverett’s duties as a senior structural engineer included design of the skid and building frame to resist stresses from crawler and sealift transporting, in addition to wind and seismic loads. The design also included support of pumps, compressors, heat exchangers, piping,cranes, monorails, stairs and platforms within the compact space of the modules. Mr. Leverett’s engineering responsibilities included heading site survey of existing process equipment and support structures in Alaska which were being tied into by this project. Additional duties included construction inspection of the modules and providing engineering support for equipment procurement. He received Bechtel’s Performance Excellence Achievement Award for high productivity of quality work for performance of duties as a Senior Civil/Structural Engineer during this project.